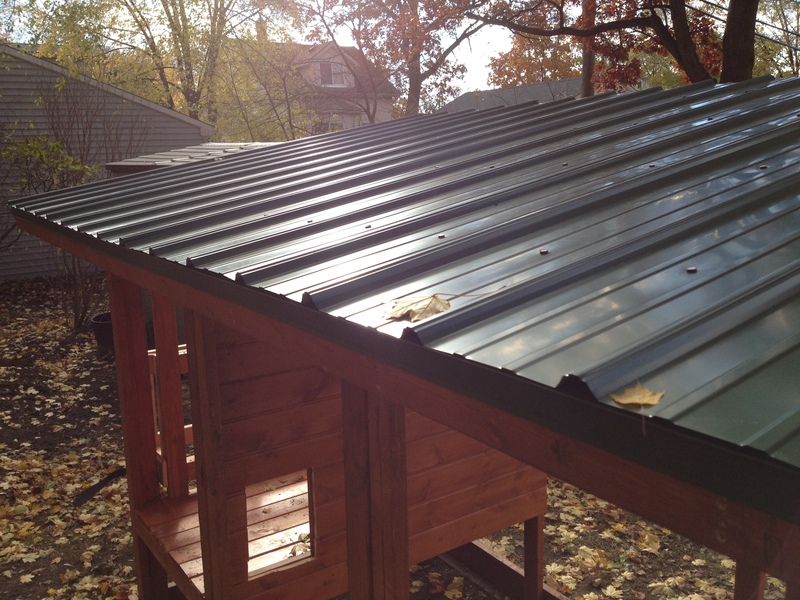 After an afternoon of work, the metal roof is finished. The chicken coop is coming together … with a little help from my friends. Today my grade school buddy Tom came by to help install the metal roof. I hired him a little over a year ago to put on the roof for my house, so I know his work is impeccable. When he offered his roofing services for the coop, I jumped at the opportunity. The day started off with a major panic attack, after realizing I purchased three sheets of plywood instead of four. Matt was nice enough to point out I was in charge of the materials list purchases. Thanks a lot, fella! After a few measurements and some quick math, Tom put my worries aside and said he’d be able to make it work with three sheets. Thank goodness! I went on an adventure trying to find plywood clips for Tom. After explaining to the guy at Ace Hardware that I was doing a roofing project and … “YOU’RE doing roofing?” he interrupted, then laughed. I pulled my hot pink purse a little tighter, and went to Home Depot, where not one, but two employees took my inquiry seriously, and sent me out the door with the proper purchase. Matt and Tom made fast work of nailing on the plywood, then Tom added the drip edging. Next, they put on the tar paper. Cutting the metal roof pieces to size was a project that required patience, but the three of us pulled together and got it done. Once the pieces were nailed in place, I climbed up on a ladder to take in the finished product. Just what I’d hoped for. What’s next? We have to install the chicken wire on the walls of the run, then frame that in with more 2X4s. We also need to finish the coop box, which includes building the back wall with tongue-and-groove wood; finishing the nesting box, a window above it and that remaining wall; and building the large door that will open into the coop box. Then, I think we will be done. This looks great! What kind of wood are you using for the structure – did you pre-stain it? Thanks so much! Yes, I pre-stained the pieces. What a job that was! For the general frame, we mostly used 2x4s. For the coop box, I’m using tongue-and-groove, 1X6.